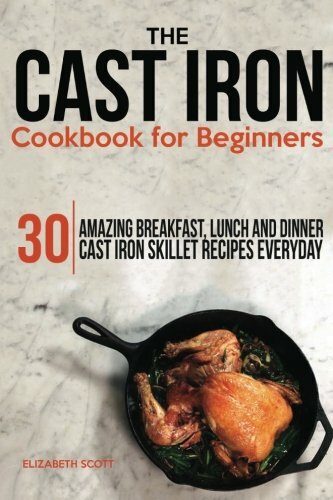 [PDF] The Cast Iron Cookbook For Beginners: 30 Amazing Breakfast, Lunch and Dinner Cast Iron Skillet Recipes Everyday | Free eBooks Download - EBOOKEE! Description: The cast-iron skillet may seem like an old-fashioned choice in your kitchen, but this ever dependable cookware is a must in any modern kitchen. They conduct heat perfectly, go from your stovetop to your oven posing no problem and can last for decades. This collection of simple, delicious and healthy recipes will show you just how much you can do with just one cast iron skillet the recipes are designed using the skillet primarily, only relying on the oven and saucepans for secondary parts of the dishes. We guarantee that after discovering the delightful breakfast, lunches and dinners you can cook with ease in this wonderful piece of equipment, youâ€™ll be desperate to benefit from the financial and health advantages the cast iron skillet offers. Hereâ€™s a snapshot of what youâ€™ll learn: â€¢ Health reasons to cook with Cast Iron Skillet â€¢ How to get the Best out of your Cast Iron Skillet â€¢ Brilliant breakfasts and brunches â€¢ And Lots Moreâ€¦.. If you have ever wanted to cook amazing meals, which are quick and easy using your Cast-Iron Skillet, then you need this book now. Take action and download this book today. No comments for "[PDF] The Cast Iron Cookbook For Beginners: 30 Amazing Breakfast, Lunch and Dinner Cast Iron Skillet Recipes Everyday".